Acne products that work on other skin types can be harmful for Asian skin. Products that work for other skin types often can be harmful to Asian skin. Many Asians have an enzyme deficiency that makes them very sensitive to hydroquinone. The products used to remove brown spots caused by acne can make them permanently black and blue. Any product to foams, fizzes, or tingles can damage Asian skin. Tiny bubbles in a thin lather are OK.
Hydrating Asian skin is more likely to treat acne than drying Asian skin. Be sure to use alcohol-free moisturizers! Flushing on Asian skin is often misdiagnosed as rosacea. Usually, it is really not rosacea. 1. People of Asian heritage can be especially sensitive to detergent cleansers. Any kind of soap or cleanser that makes big bubbles can break down the stratus corneum, the outermost layer of living skin. People who have Asian skin types, and especially people who have Japanese skin types, are especially sensitive to detergents. Not only do sudsing, foaming, big-bubble soaps and cleaners not clear up the skin, they can even cause worse breakouts of tiny pimples almost immediately after contact. Most people who are of Asian descent should wear gloves when handling any kind of detergent. Any skin cleanser should make a thin, creamy lather with barely visible bubbles. 2. Many people of Asian heritage have a hereditary condition called onchronosis that makes them very sensitive to skin lighteners. Onchronosis is a genetic condition causing lack of an enzyme the body needs to utilize the amino acids tyrosine and phenylalanine. It causes cumulative damage to bones and joints often misdiagnosed by Western doctors as osteoporosis. It can also cause a much more obvious symptom, black and blue discoloration of the skin, especially around the eyes and on the ears. The dark discoloration of the skin can also occur as a reaction to exposure to industrial solvents, gasoline, benzene, or hydroquinone, which ironically is a product used to lighten the skin. The unfortunate reality is that when people with Asian skin tones use hydroquinone to remove brown spots on the skin left by acne, they often develop black and blue spots caused by onchronosis. Asian skin types must never be treated with products that contain hydroquinone, such as the Murad line of cosmetics. 3. Most Asians (and most people with tight, oily skin) are very sensitive to stinging and irritation from skin care products. 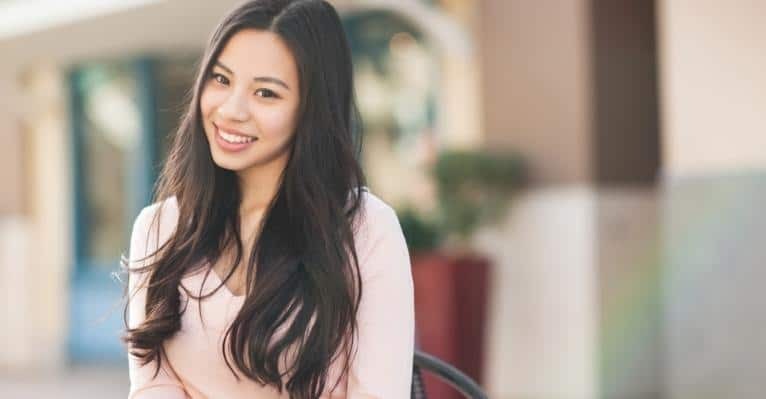 If you have an Asian skin type, chances are that any product that leaves your skin feeling “tingly” can cause irritation and even brown spotting of the skin. This means that products that contain alcohol, citrus extracts, lemon oil (although lemon juice is OK), eugenol, cinnamon, eucalyptus, hammamelis, calamine, benzoin, mint, peppermint, tea tree oil, wintergreen, or menthol have to be used with caution, as do all benzoyl peroxide products. 4. Most Asians are more concerned about spots than wrinkles, and to prevent spots, they should treat pimples as early as possible. Overexposure to the sun can leave brown spots on the skin, and so can acne. To minimize the formation of brown spots after acne heals, always treat acne with products that cause the least possible inflammation, and treat pimples as soon you see them. One of the ways acne bacteria defend themselves is by making surrounding skin cells more susceptible to inflammation generated by the immune system. The sooner you treat a pimple, the less sensitizing chemicals they secrete. 5. Many Asian experience skin breakouts similar to rosacea after they drink. These usually are not actual rosacea. Many Asians, especially Koreans, lack an enzyme that detoxifies alcohol. Taking a shot or two of hard liquor can cause reddening of the skin, especially across the cheeks, around the eyes, and on the nose. This is not rosacea. It is a reaction to alcohol. Usually other symptoms are so unpleasant that the reaction is self-limiting. 6. Even though Asian skin looks light, it usually requires the same treatment as darker skin. Asians tend to get spots from acne that can be made worse by some of the products used to lighten them. Higher concentrations of benzoyl peroxide (over 5%) and higher concentrations of alpha-hydroxy acid peels (over 10%) or beta-hydroxy acid peels (over 2%) also can cause permanent damage to Asian skin. If you have Asian skin and you choose to use a mild facial peel, it is essential that you also use a neutralizing product to ensure that there is no damage to the skin. If you are getting a treatment at an aesthetician’s office or at a spa, make sure you get a “light” peel, just in case the provider is not familiar with Asian skin. Or better yet, go to aestheticians and spas that specialize in treating Asian skin. 7. Asians need to wash their faces after they wash their hair. Shampoo usually generates big bubbles to blast oil off hair. Unfortunately this can also damage to skin on the face. It is important to rinse the face after washing the hair to prevent redness and inflammation that can add to or cause brown spots, and it is also important to make sure the skin of the face does not come in contact with hair gels or leave-in conditioners. 8. Treating acne on Asian skin with a hydrating cleanser is more successful than treating acne with a drying cleanser. Many Asians respond well to cleansers or cleansing pads that contain oil and respond poorly to cleansers or cleansing pads that contain alcohol. Oil in cleansers can dissolve excess oil on the skin, allowing it to be easily rinsed away. Alcohol in cleansers temporarily removes the “shine” from skin, but the skin responds to the drying effects of alcohol by producing even more oil later. 9. Certain ingredients in skin care products make acne (and any spots left after it heals) darker and more noticeable on Asian skin. People who have Asian skin types need to avoid products that contain Achillea millefolium (yarrow), cedar, dandelion, geranium, jasmine, ylang-ylang (Cananga odorata), lemon grass, lemon oil (but not lemon juice), rose attar, rose otto, rosemary, and sandalwood. 10. Tea tree oil is usually not a good idea for treating acne on Asian skin. Neither is Manuka honey, which is collected from hives of bees that feed on tea tree flowers. Tea tree oil is usually anti-inflammatory, but a surprisingly large number of people who have Asian skin types are allergic to it. Allergies, like cuts, scrapes, infections, and overly aggressive acne treatments, can irritate and darken Asian skin. Hello. This website is very informative for Asian skin care. Thank you! I have recently been browsing through ayurvedic skin care products and many of them contain sandalwood or rose water. Can you explain more about Asian skin sensitivity to these ingredients? Im 25 and started breaking out for the first time after having my baby last year.im half australian half filipino but found out my skin is more sensitive whilst i was coin a hairdressing apprenticeship and would get bad dermatitis on my hands when constantly washing hair with all the shampoos and chemicals in colours. i tried using proactive but it was no good,i even went to a holistic specialist and had fortnightly glycolic peels but would badly break out a few days after treatment.then by chance whilst shopping in one of austarlias high end malls i was looking at make up by "Shu Eumura" when talking to the brands assistant about my skin she recommend i use their brightening cleansing oil. i was amazed on how well it worked after one was and how much better my skin felt with no stinging or burning or tingling at all. i recommend any asian or oily skin type try a cleansing oil. then follow with a light moisturiser like la rosy posay's sensitive asian skin range.its takes about 28day for your skin to renew itself so don't give up and go back to a stripping harsh cleanser after two weeks just be patient and you'll see results before you know it! Hello, I have light acne, but I use tea tree oil but it seems to help me? So does honey(not manuka honey). I've been using a slightly foamy cleanser and I was wondering if that was working or not. Is there any type of test I could take to see if I have "asian skin"? I think i have pretty normal skin. I started getting acne in 6th grade I had bangs(which made it worse) and then in 7th grade I grew out my bangs and my acne got a lot better. Now its just a little bit of scarring and a little bit of acne on my cheeks and forehead. I used a variety of foam, cream, oil free products that have slightly helped me. I stopped using benzoyl peroxide, but still use salicylic acid in my face wash. Any advice for me? I'm only 13, so I can't use too expensive stuff. I also want to approach a more healthy approach instead of those harsh cleansers. Thank you please reply as soon as possible!!!!! Can you please provide or cite your references. As a japanese male with adult acne, I believe that this is a great article that I would love to do some further research on and hopefully apply it to my current skin care regimen, however I can’t decifer whether you’ve obtained your information from any type of scholarly article, or research based findings. A lot of what you’ve stated in this piece seems to contradict the American Academy of Dermatology and what an Asian dermatologist has recently told me. It would be great if you provided some references so those of us who are of asian ethnicity and suffer from acne/hyperpigmentation could bring this to the attention of our docs and hopefully find a better regimen. -Thanks!